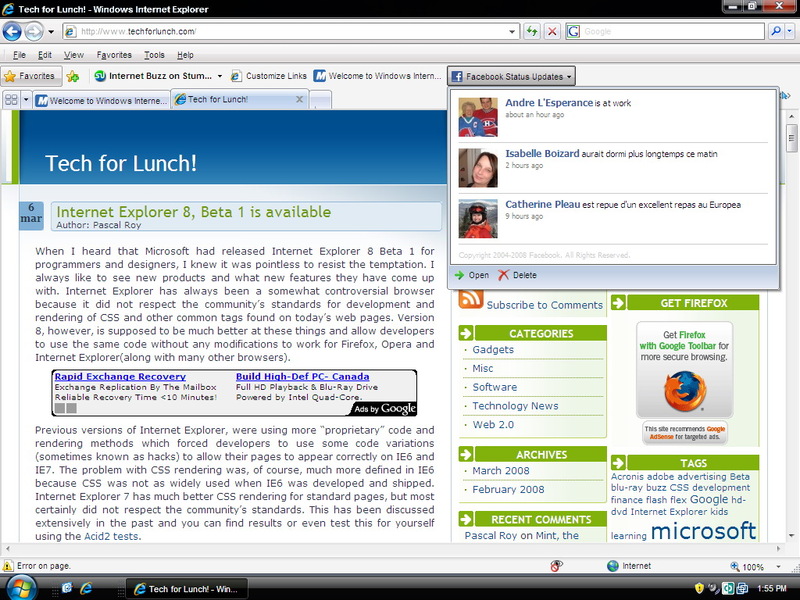 Internet Explorer 8, New Features | Tech for Lunch! Yesterday, I looked at the new Internet Explorer 8, Beta 1 and mostly discussed the internal behavior and rendering capabilities. Today, I wanted to show you what some of the new features are in more detail. There are quite a few improvements, but many of them are “Features” that should have been there a long time ago or were already implemented in other browsers such as firefox. Let’s start with the two most important ones: Webslices and Activities. Activities add a contextual (usually a right-click) access to an external service, based on what page you are on or the selected text. Typically, these services will allow you to LOOK-UP information, such as a map, news on that subject or a dictionary definition, or SEND information to a blog, email or facebook profile etc. take a look at the screenshot I made in which I highlighted a postal code and got the map for it. You can move around in that pop-up map just like any other map. Notice the domain name(netfix.ca) is in bold in the address bar. That is also a new security feature to allow users to quickly identify which domain they are on to protect against phishing, typos and misguiding URLs. Webslices are done by website developers who will make a portion (or a slice) of a page available to users. Users can subscribe to that slice and get updates regularly from wherever they are on the internet. When you subscribe to a slice, it gets added at the top of your IE8 window and turns bold when an update is available. You could use webslices to get weather, ebay auctions, news feeds, facebook friends statuses, stumbleupon buzz etc.. Basically anything that gets updated so you don’t have to navigate to that page everytime you want to see what’s going on. I think webslices will be like sidebar gadgets for Windows Vista and we will see slices for just about anything eventually. That’s probably one of the reasons why IE8 beta 1 is for “developers” ;-) Notice in this screenshot that the domain is also in bold in the address bar. So this covers the two main new features of IE8, but another one that is worth mentioning for those of us who had to wait for it, is the developer tools. You can now debug HTML, JScript and CSS directly in the browser. Tools like these have been a part of firefox for quite some time, but hey.. better late than never! Most of the other improvements are for stability and speed. Rendering of HTML and CSS as well as JScript should now be a bit faster with IE8 and more improvements are set to be released with the next betas. We’ll just have to wait and see what the community’s feedback will be and what Microsoft will do about it. Pingback: Microsoft launches Internet Explorer 8 | Tech for Lunch!